SERMONS PREACHED FROM THE FIRST CHRISTIAN CHURCH, NORTHAMPTON, MA, AND OTHER PULPITS ACROSS PURITAN NEW ENGLAND FROM 1731-1758. An unregenerate man hates and resists the very idea expressed here (John 3:19). But the words are beautiful to one whom the Spirit has quickened. Knowing he justly deserves God's wrath, the believer never ceases to wonder at the great mercy God has shown Him in Christ. 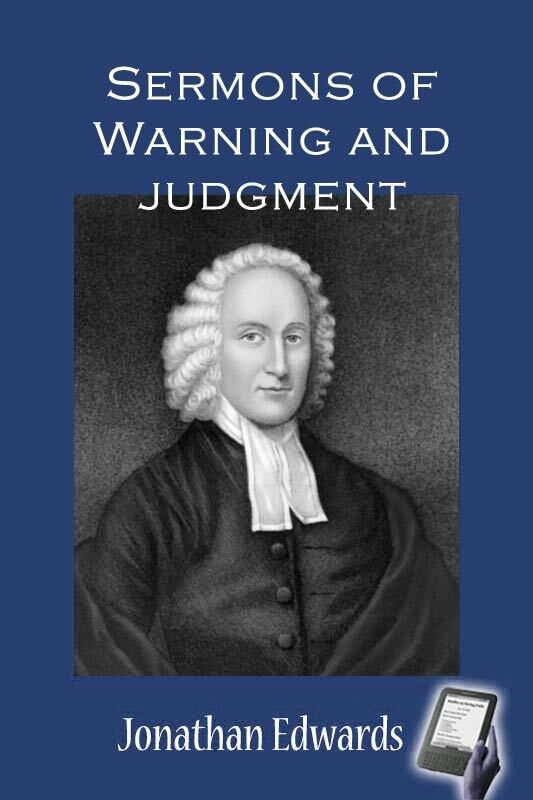 Although, from afar, many may scorn at these sermons by Edwards but, in reality, their main doctrinal emphasis is that God mainly not in sending the wicked into the place of punishment or in bringing judgment upon them. Rather, God’s active role in the judgment of the wicked is, by his great mercy, to keep them from experiencing this just wrath and this is due not to any righeousness in the wicked but only by the sheer grace of a merciful and sovereign God in Jesus Christ. The Final Judgment - Acts 17:31 - Because he hath appointed a day, in the which he will judge the world in righteousness by that man whom he hath ordained. Sinners in the Hands of an Angry God- Deuteronomy 32:35 - Their foot shall slide in due time. The Vain Self Flatteries of the Sinner - Psalm 36:2 - For he flattereth himself in his own eyes, until his iniquity be found to be hateful. The Future Punishment of the Wicked Unavoidable and Intolerable - Ezekiel 22:14 - Can thine heart endure, or can thine hands be strong in the days that I shall deal with thee? I the Lord save spoken it, and will do it. The Justice of God in the Damnation of Sinners - Romans 3:19 - ...That every mouth may be stopped..
Wicked Men Useful in Their Destruction Only - Ezekiel 15:2-4 - Son of man, What is the vine tree more than any tree? Or than a branch which is among the trees of the forest? Shall wood be taken thereof to do any work? Or will men take a pin of it to hang any vessel thereon? Behold, it is cast into the fire for fuel; The fire devoureth both the ends of it, and the midst of it is burnt: Is it meet for any work? The End of the Wicked Contemplated by the Righteous - Revelation 18:20 - Rejoice over her thou heaven, and ye holy apostles and prophets; for God hath avenged you on her. Wicked Men of the Past are Still in Hell - 1 Peter 3:19, 20 - By which also he went and preached to the spirits in prison, etc... . The Portion of the Wicked - Romans 2:8, 9 - But unto them that are contentious, and do not obey the truth, but obey unrighteousness, indignation and wrath, tribulation and anguish, upon every soul of man that doeth evil, of the Jew first, and also of the Gentile.When the Wicked Shall Have Filled Up the Measure of Their Sin, Wrath Will Come Upon Them to the Uttermost - 1 Thessalonians 2:16 - To fill up their sins alway; for the wrath is come upon them to the uttermost. Sinners in Zion Tenderly Warned - Isaiah 33:14 - The sinners in Zion are afraid; fearfulness hath surprised the hypocrites. Who among us shall dwell with the devouring fire? who among us shall dwell with everlasting burnings? The Eternity of Hells Torments - Matthew 25:46 - These shall go away into everlasting punishment. Sinners Delay Concerns the Soul - Acts 24:25 - And as he reasoned of righteousness, temperance, and judgment to come, Felix trembled, and answered, Go thy way for this time; when I have a convenient season, I will call for thee. Natural Men in a Dreadful Condition - Acts 16:29, 30 - Then he called for a light, and sprang in, and came trembling, and fell down before Paul and Silas, and brought them out, and said, Sirs what must I do to be saved?